Power LED: This LED is lighted green when the unit is functioning, and blinks when a firmware download is in progress. This LED is lighted amber during a reboot, a reset, or self-test. Status LED: This LED is lighted green when wireless functionality is enabled and blinks when there is wireless activity. This LED is not lighted when wireless functionality is disabled. WAN LED: This LED is lighted green when a 100mbps device is connected and lighted amber when a 10mbps device is connected. When traffic is moving through the device, the LED flashes. LAN 1-4 LEDs: These LEDs are lighted green when a 100mbps device is connected and lighted amber when a 10mbps device is connected. When traffic is moving through the device, these LEDs flash. RESET Button: Press in and hold the RESET button for between five and ten seconds. This will reset the Wireless Turbo Access Point & Router to the factory default settings. LAN Ports 1 - 4: The RJ-45 LAN ports are used to connect Ethernet devices to the LAN. WAN: The RJ-45 WAN port is used to connect the Wireless Turbo Access Point & Router to a broadband modem. 5VDC: This connection port is for the power supply of the Wireless Turbo Access Point & Router. Antenna Ports: These connection ports are reverse polarity, SMA male connectors. 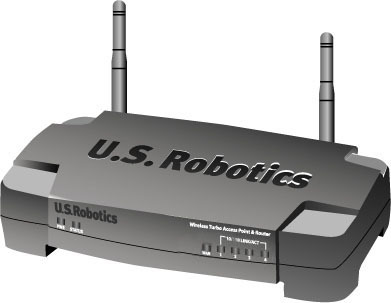 Note: The USRobotics Wireless Turbo Access Point & Router can easily be connected to any Ethernet-based cable modem or DSL modem. You can verify compatibility by checking to see if your cable or DSL modem is connected to the network adapter in your computer using an Ethernet cable. 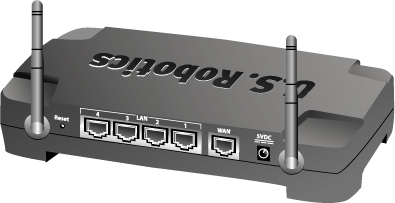 The Wireless Turbo Access Point & Router cannot be connected to a cable or DSL modem that only uses a USB connection. There are four types of WAN network connections that are supported by the Wireless Turbo Access Point & Router: Static IP Address, Dynamic IP Address, PPP over Ethernet, or PPTP. If you have a Static IP, Dynamic IP Address, PPP over Ethernet, or PPTP connection, refer to Appendix A in the Specialized Internet Connection Instructions section. If you are unsure about the specifics of your network connection, contact your Internet Service Provider (ISP).